While we were in Asheville, I picked up three skeins of Malabrigo Twist yarn. I've never knit with this yarn before. Very soft, very cooshy. I liked it. 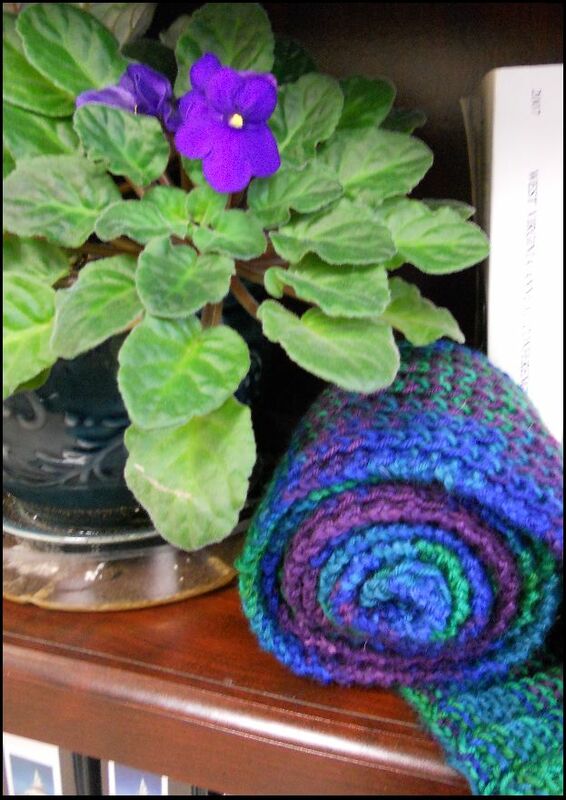 The colors reminded me of my mom, but the yarn store didn't have three hanks in all the same color -- I bought three different colors and worked out a way to use them all in the scarf. 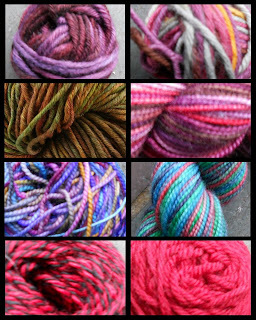 Yarn: Malabrigo Twist yarn, one hank each in Cookie, Velvet Grape and Liquid Amber. I used all of the Cookie, and almost all of the other two. Needles: Knitpicks Options (metal) in US size 9 with a 60 inch cable. Pattern: No pattern, I just made something up. I cast on 300 stitches with color A (Liquid Amber). I knit the scarf in moss stitch (knit purl knit purl, etc, and then on the next row, I knit the purls and purled the knits). At the end of each row, I broke the yarn, leaving enough of a tail for fringe. 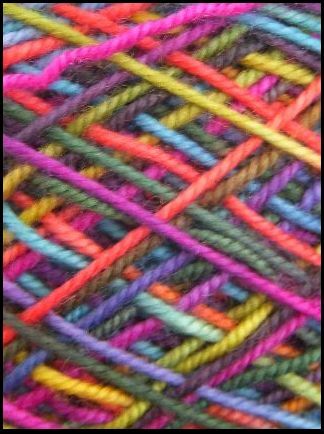 The patten of colors I used was 2 of color A (Cookie), 1 row of color B (Velvet Grape), 2 rows of color C (Liquid Amber), 1 row of B, 2 rows of A, 1 row of B, 2 rows of C, etc. I hope that makes sense. 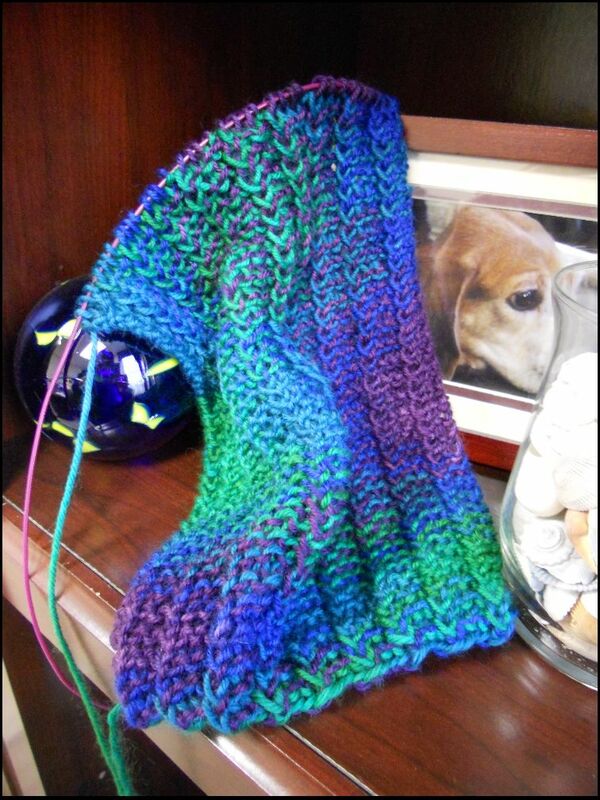 Size: I cast on 300 stitches, thinking that would give me a 5 foot long scarf, knit lengthwise. I ended up with a giant 7 foot, six inch scarf (not counting the fringe). Giant, I tell you! I should have cast on fewer stitches. It is six inches wide. I've always been interested in the Red Scarf Project of the Orphan Foundation of America, but I've never remembered about it in time to actually knit a scarf. This year I did. I bought the yarn at Yarn Paradise in Asheville, and knit the scarf. 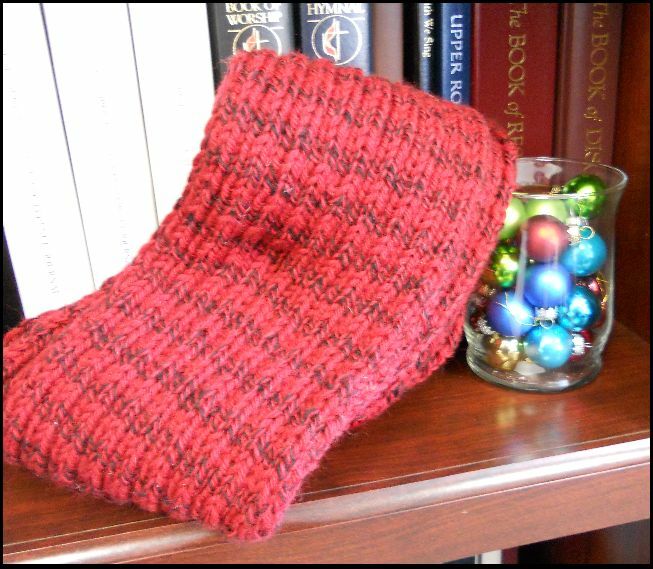 Yarn: I used two skeins of Cascase 220 yarn -- one in red, and one in a red/black combination. I alternated them in 2 row stripes. The red in both yarns was the same. Needles: KnitPicks metal Options, US size 8, on a 24 inch cord. Pattern: No pattern, really. I cast on 38 stitches and knit a 2 x 2 ribbing. Size: I didn't measure it, but it was my normal "at least five feet long" scarf, with no fringe. I sent it to the Foundation on December 14; I hope they'll accept it a day late (the deadline was December 15). Before I mailed it, I said a prayer with it. Last night, I picked up my Knotty gloves and finished them. The last of the pair (and the first started -- see this post) had been waiting patiently other higher priority projects to be finished. I just had to add two fingers and a thumb, plus weave in all the ends. 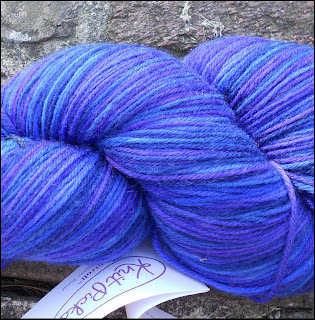 Yarn: Socks that Rock, Lightweight, in Spinel. I ordered one hank, and have some left, so it took less than one hank. Love the yarn; love the color. 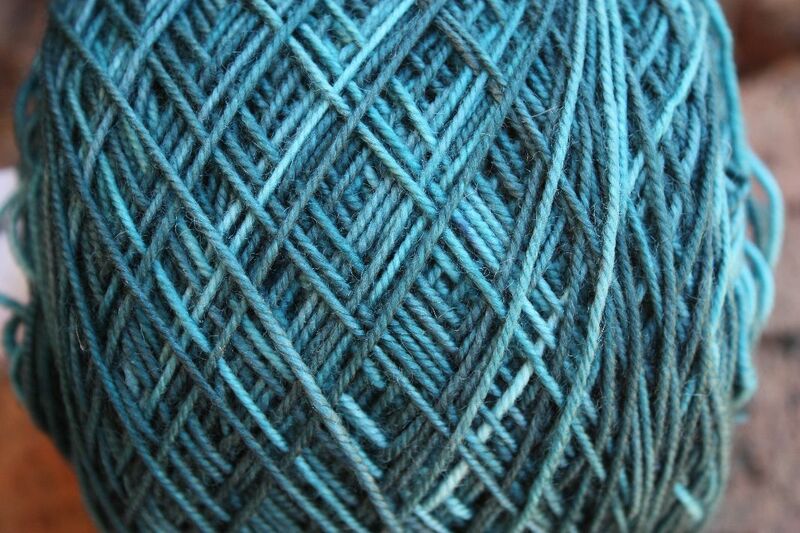 Might need to find some scarf yarn that echoes the teal color. Needles: 2.5mm double pointed harmony needles from Knitpicks. These were sock needles. I know they sell shorter needles that might be more appropriate for fingers of a glove, but short needles hurt my hands. The longer ones are fine, and I like double pointed needles. Pattern: Knotty Gloves by Julie Mueller. This is a free downloadable pattern. It is easy to follow; nice pattern. I really like the cabling work on the back of the hand. The only change I made is that I knit the cuff about half the length the pattern calls for. If you are knitting them, keep that in mind when you consider yarn usage. I imagine one hank would still have done it, but I'm not sure. 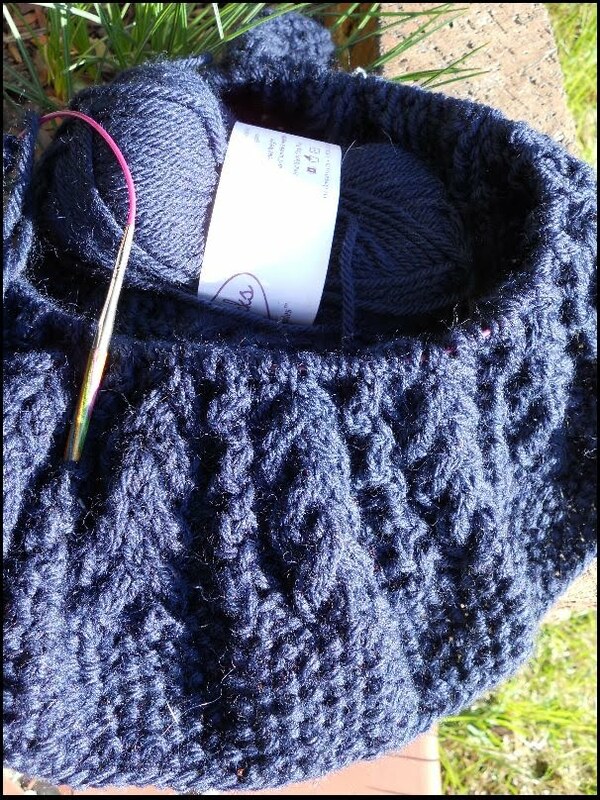 Skills that are helpful to know for this pattern: Cabling, and if you can do it without a needle, the knitting will go faster. Here's a link that helped me when I first learned to do this -- excellent skill to master. I wonder if I should have gone down a needle size; I seem to be learning that I knit at a looser gauge that what yarn and patterns normally call for, and of course, I didn't knit a swatch. They are OK in fit, but might have been better a little smaller. Knitting gloves is great. You just try them on and knit the fingers to a custom length. That's really cool. My only bummer about these gloves was that as I was finishing the weaving of ends, I noticed what looked like a moth hole in the cuff. Now I"m worried I have moths! I would also like to know if there is a way to knot gloves without getting holes between the fingers. I go back when I'm finished and sew them together, but why are they there in the first place? I've been posting about our trip to Asheville in relationship to the Traveling Scarf, so I thought I would post about the yarn portion of that trip. We were very leisurely about our visit to Asheville, sleeping as late as we wanted and not keeping any kind of set schedule. It was great! 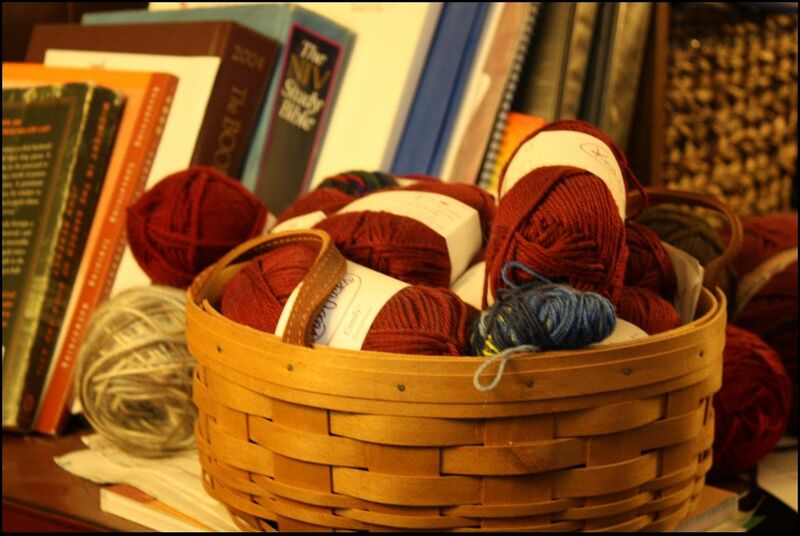 Before we went into Biltmore Estate, we stopped at a great yarn store called Yarn Paradise. 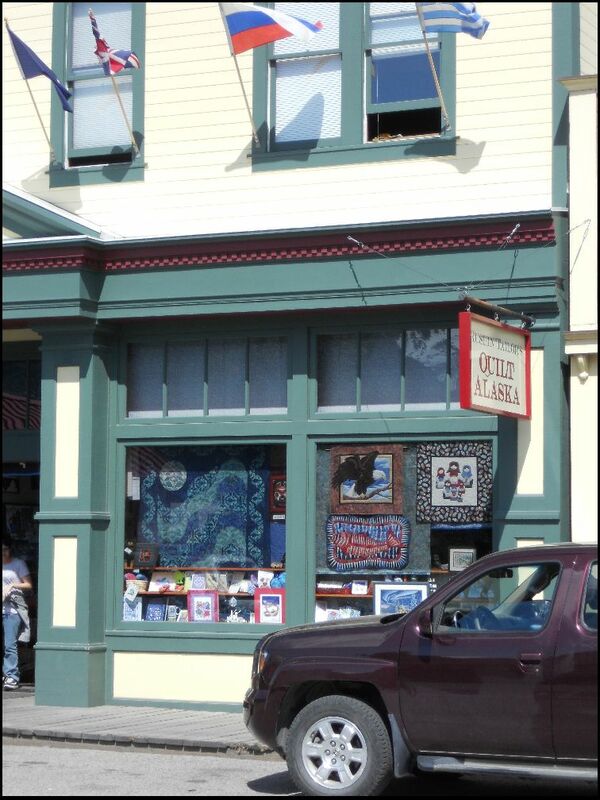 I enjoyed the store. 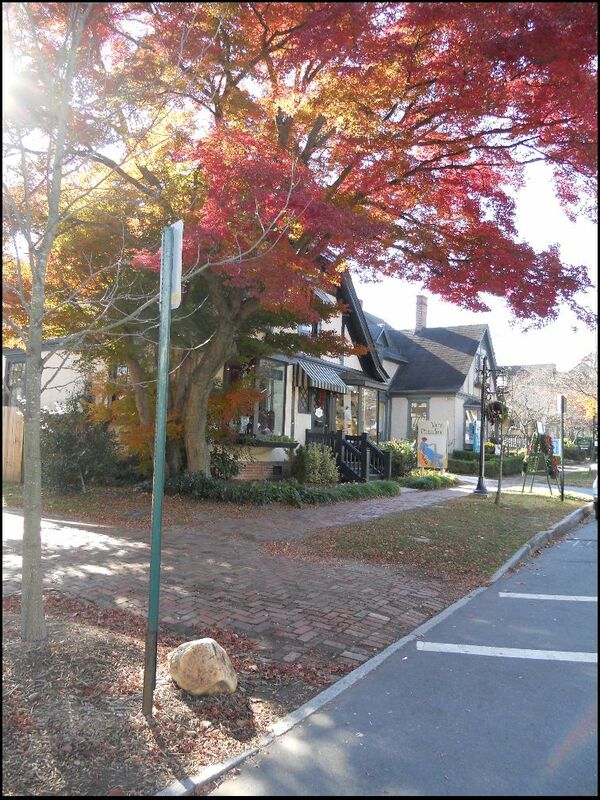 It is located in Biltmore Village. 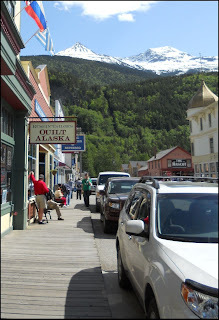 Next time I'm there, I would love to spend some time in just that shopping area. It looked great! I bought three skeins of Malabrigo Twist -- one each of Cookie (#2), Velvet Grapes (#1) and Liquid Amber (#3). I've since used these three skeins for a Christmas present scarf (post coming). 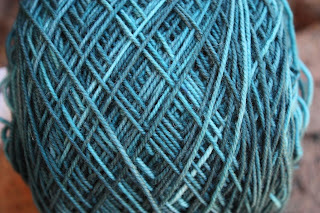 I bought two skeins of Koigu -- one in a mainly blue combination (Koigu 470 - #5) and one in a combination of teals (Koigu 581 - #6). I also picked up a Claudia Handpaints in Plumicious (#4). In November, Steve and I took a trip to Asheville, North Carolina to spend the weekend, visiting Biltmore Estate. We didn't leave until after a board meeting I had in the evening, so we drove in the dark the entire trip south. I knew I would need knitting that I could do in the dark -- a simple scarf was the ticket. I took Wednesday off from work after we got back and went to see two movies, and then one with the my guys on Friday, and again on Saturday -- the scarf made a great movie knitting project, especially for Harry Potter. 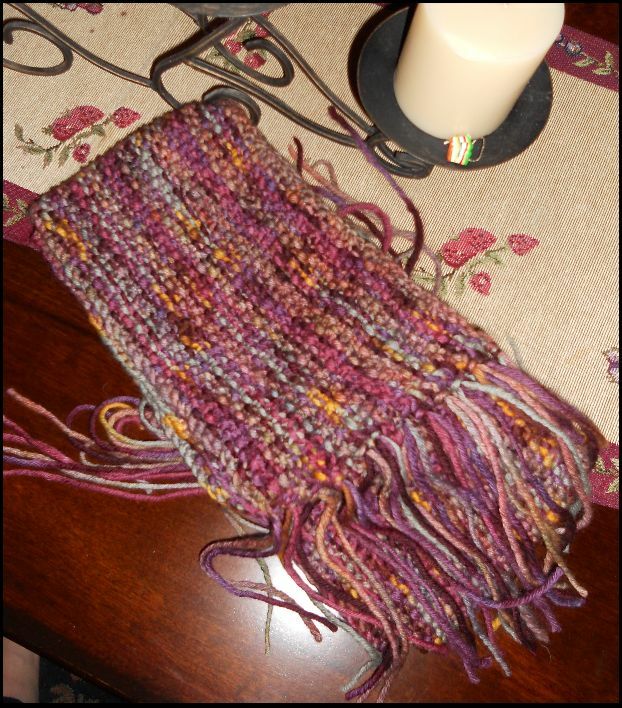 So, meet another finished object -- my traveling scarf. It is knit from yarn purchased in Alaska, knit on a trip to North Carolina (through a total of six states) and then knit on a trip to Harry Potter land. Yarn: As I said, I purchased the yarn in Scagway, Alaska. 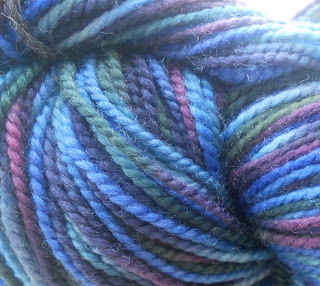 It is Raven Frog Fiber Arts Marvelous Merino (superwash yarn). The color is Princess Matsoutoff's Gown -- a nice combination of blue, green and purple. I like how the colors zig zag through the scarf. 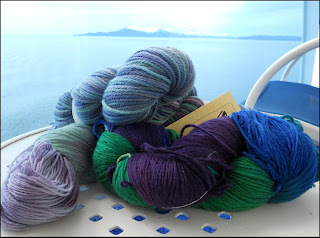 It was a skein of 550 yards -- I have a nice amount left. Needles: The final choice was US size 7 needles. I started it with US size 8, and knit about four inches. On the way back from Asheville, I finally gave into the idea that the fabric was too holy and drapey -- I ripped and started again with the US 7 - much better. 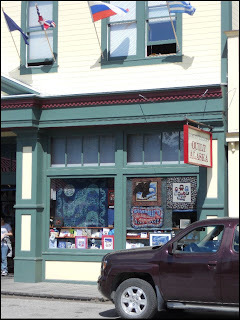 I also liked the flow of color using the US 7. 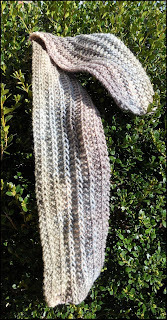 Pattern: Once again, it its the Yarn Harlot's One Row Handspun Scarf (Ravelry link) . I cast on 38 stitches and knit about 5 feet. I was listening to Cast On (a podcast) on the way home this evening. The conversation the Brenda was having with someone (I can't remember who, now) was about knitting mistakes and how to correct them. I have learned how to drop a stitch and correct a mistake that is a few rows back. I can make cables twist in the opposite direction (changing the direction from the wrong way to the right way). I can pick up a dropped stitch and knit it up the line. I can correct a missing decrease and add in an increase. Corrections such as this, made in a vertical manner, have saved me endless amounts of tinking and ripping. I have learned to count. Count. Count. Count the rows and make sure the counts are correct. Use markers. Use whatever it takes to make sure the number of stitches on the needles is correct. I've learned how to read a chart. I love charts. I've learned if there is a mistake that is bothering me, it will always bother me. 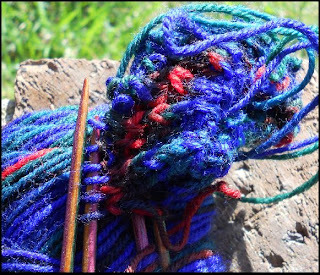 It is best to fix it, even if it means starting over, or unknitting many rows. 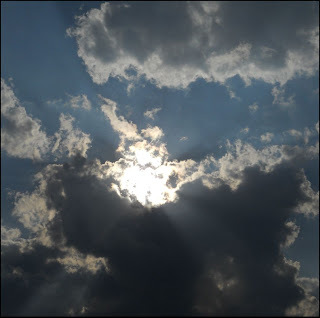 I've learned if there is something I don't know how to do, that someone on the Internet already knows how to do it, and has posted the information, probably with a video. I just need to look for it. I've learned how to knit continental style. 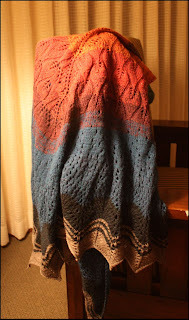 This awakened my sleeping crochet skills of yarn tensioning -- I knit better continental style, and I knit faster. I've learned how to knit cables without a cable needed. Tremendously helpful. There are only two stitches, and very little is too hard. It's all just those two stitches and following directions. I've learned to remember that knitting is supposed to be fun. If it's not fun, why do it? We drove to Asheville last weekend, leaving Ashland after my Emmaus Board meeting. I knew that meant that we would be driving in the dark, so I wanted a simple knitting project that I could knit without seeing it. I took the Raven Frog yarn I bought in Alaska and started a One Row Yarn Harlot scarf (38 stitches wide). I knit on the way down and while we were in Asheville using a US size 8 needle. I just didn't like it. I kept trying to talk myself into liking it, but no luck. On the way back home, I frogged the six inches I had knit, and started over, using a US size 7 needle. Much better. Currently, the scarf is about 4 feet long. 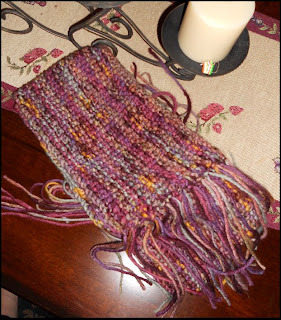 Picture soon -- I really like how the color is dancing through the scarf. As I finished the Seasons Shawl, I had a yen to knit gloves. 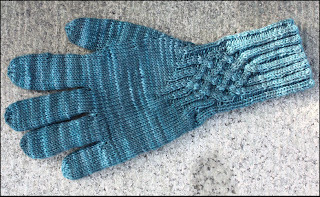 I found a pattern of Ravelry called Knotty Gloves by Julia Mueller -- free pattern for some very attractive gloves. She knit the pair in the pattern using Socks that Rock yarn in a color called Grawk. 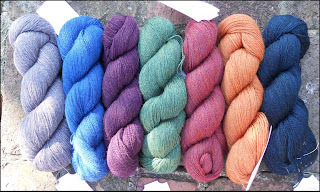 I like Socks that Rock yarn, so I opened up the computer and went searching on their website for yarn colors that appealed to me. Have you ever done that? 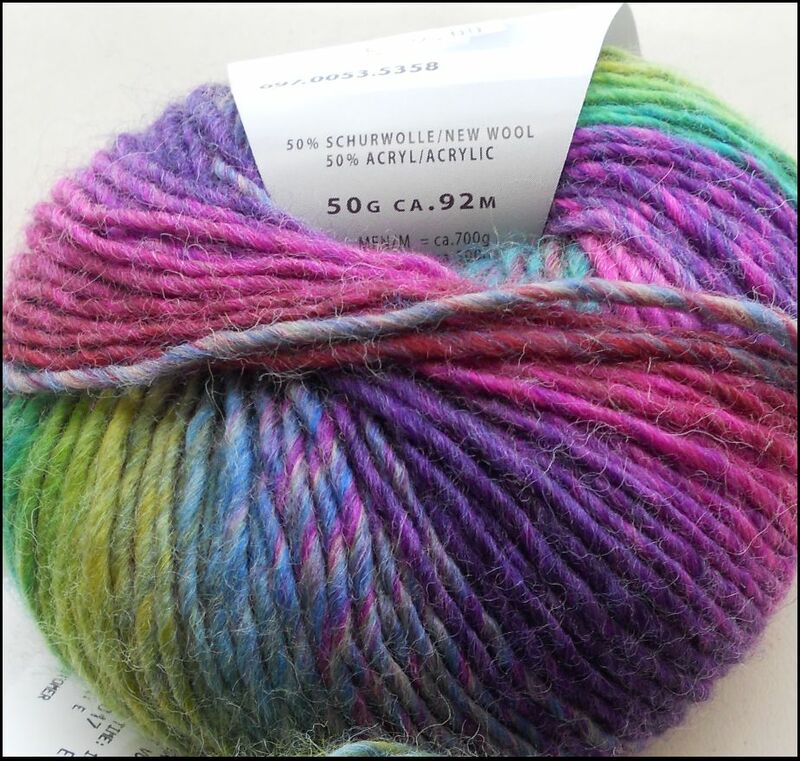 Do you know how long you can look at pictures of yarn on the Socks that Rock website? Hours later, I placed an order for one hank of Spinel and one of Corbie. Spinel is a shaded solid color -- one color, dark into light and back again. 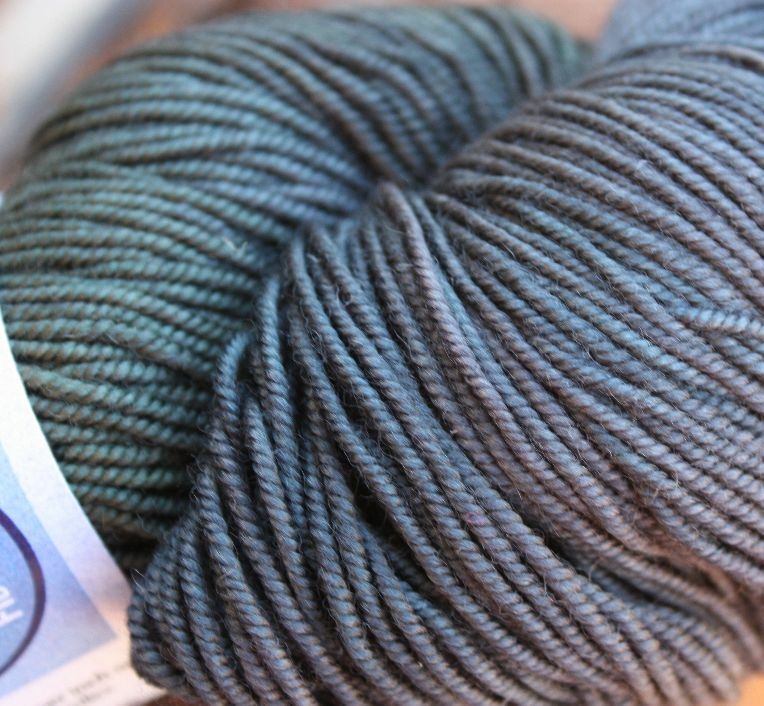 Corbie is part of the Raven clan group of yarn -- black yarn overdyed with other colors (Grawk is also one of those). I used the Spinel to work on the gloves. I started them on the way to Kansas City as a traveling project. One the flight to the city and then while in town, I finished the hand and one finger of one glove. Knowing that knitting gloves requires snipping the yarn and starting another finger, I put the first glove aside and started on the second one for the flight back -- no scissors required. So far, the second glove is finished and I have two fingers and a thumb to finish for the first glove. A very strange way to knit gloves! Image: Glove on the base of the John Wesley statue at WV Wesleyan College (although you can't tell). I'm behind! I have much to post and haven't been keeping up with it. I have some time this morning (before I keep my date with Mr. Potter), so hopefully, I can write some posts and catch up! First of all, a Finished Object. A Big Finished Object. Meet my completed and blocked Fall/Winter Seasons Shawl. (That's a Ravelry link.) 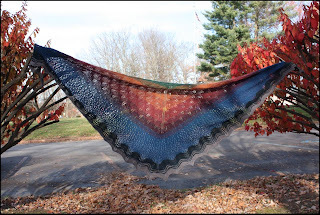 I purchased the kit to make the shawl from Knitpicks, but once it sold out, that haven't re-offered it (hence, no Knitpicks link). Click this link, and see my blog posts relating to the shawl. I have knit lace before, but never something this large, so it was a New Experience for me. I liked it! The shawl is designed to move from the beginning of fall (the green section) through several autumn colors in a leaf lace knitting pattern. The fall season fades to winter as burgundy transitions to blue. The blue section is "snow" followed by midnight blue "snow drifts" and then the final granite "icicles." I liked the concept, and I like the finished project. I had a few challenges with is. First, I must knit at a gauge that is larger than that of the test knitters at KnitPick. 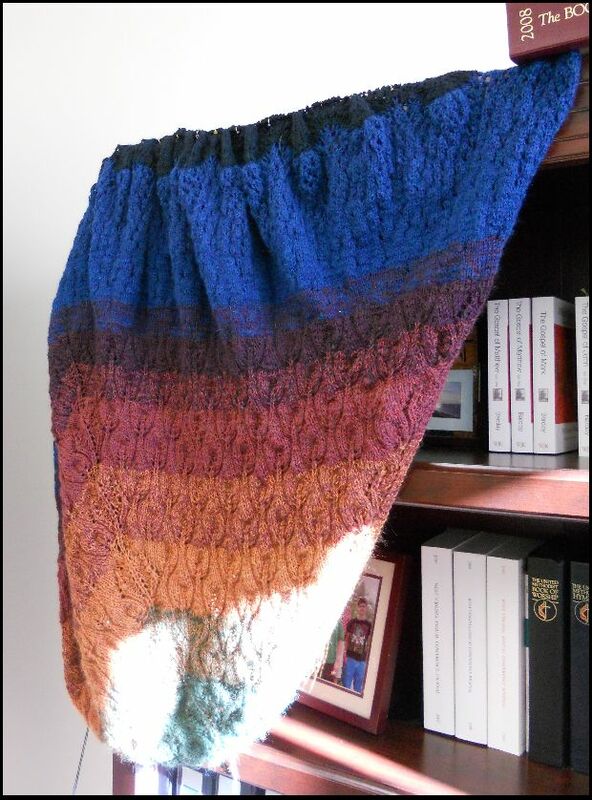 I read many posts on Ravelry about the shawl, and some people were running out of yarn. I ordered extra -- great idea, since as I ran out, I had what I needed. 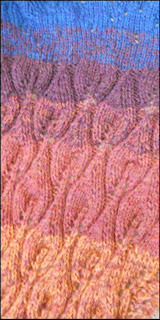 There are a few errors in the pattern, as noted on the Knitpicks site. 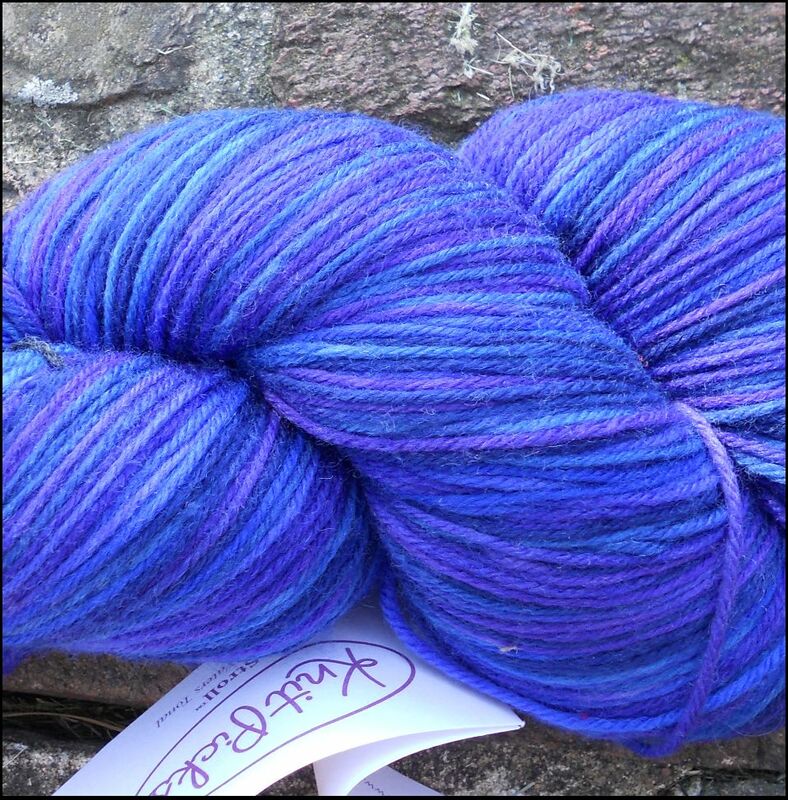 Anyone knitting it should go and get the errata page! I also found a difficulty in the row that knits into the triple yarn overs -- it's very near the end of the pattern. 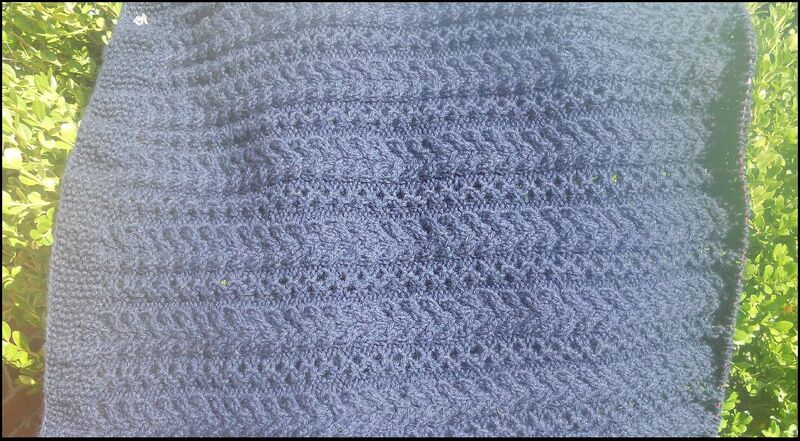 There is an extra stitch that is not accounted for in the pattern. I just knit it, but I'm not sure that is the best result -- the point of each icicle is a little off to the side because of the extra stitch. No big deal, but I would rather it be symmetrical. Basalt - 2 (one more than kit) -- I only needed the second hank for two rows! 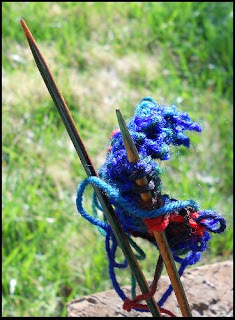 Needles: I used KnitPicks Harmony needles, US size 5, and I just kept changing the cord as I needed it to be longer. I bound off with double pointed, US size 9. It didn't need to be double pointed, but it worked just great. Size: Oh, bigger than the pattern says it will be (which explains the extra yarn). It measures 104 inches across the top. I can't remember the back to point measurement. I like the size. It's large, but great to wrap up in. Images: I took the shawl with me for a college visit with my son. I knew we would be in places that would make great backgrounds for a photo shoot. The first one -- the official "finished object" photo, is on the campus of West Virginia Wesleyan College. The next one is in our room, and it shows the transitions and stitches to best advantage. The last one is at Stonewall Resort, outside at sunrise. I picked it because it shows the holes (isn't that a strange reason to pick an image?). Finally! Another finished object. 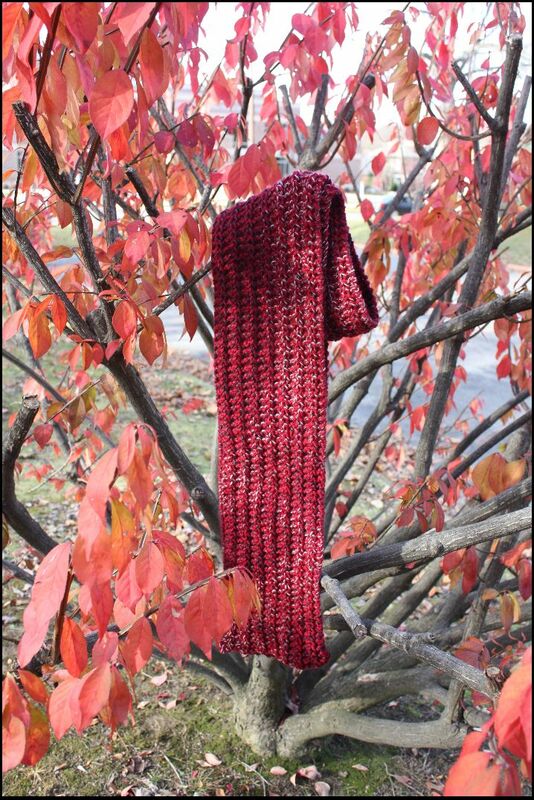 I wanted to knit a scarf that would match my red and black coat. 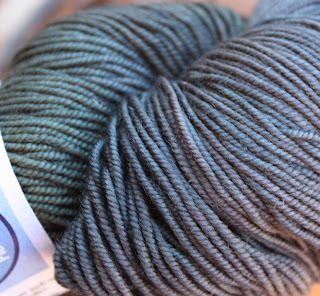 The Knitpicks yarn, Kavanagh, jumped out at me. Pattern: This is knit using the Yarn Harlot's one row Handspun scarf pattern. It's easily memorized -- it's only one row that is repeated over and over. This is not the first scarf I have knit using this pattern. I always like the outcome. 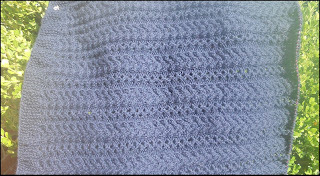 it's reversible and results in a soft, wafflely scarf that has lots of loft, and keeps you warm. 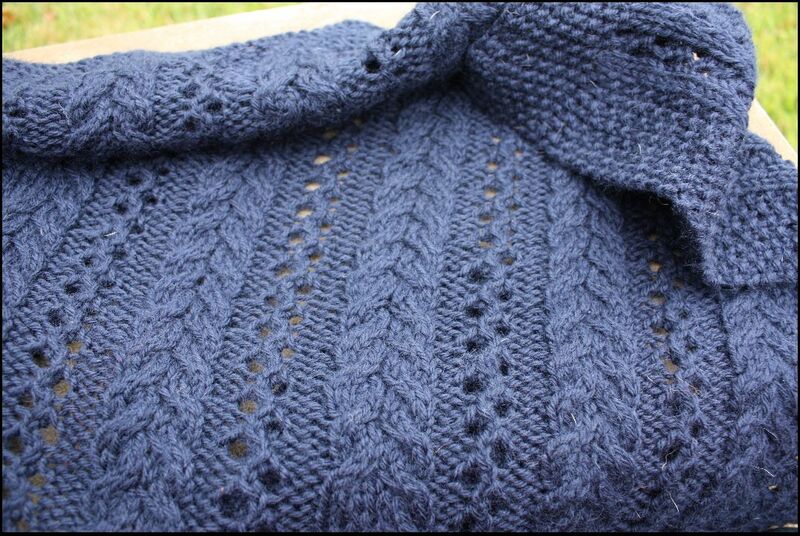 Yarn: I used Shamock, a heavy worsted weight yarn from Knitspicks. The color is called Kavanagh. I used 5 skiens. I still have a couple of more in case I want to add fringe. Needles: I used size US 9 needles. How about an update on the Seasons shawl? I like the colors -- each one more than the last. I could leave behind the green beginning color and the orange one that follows. The two of them together look like peas and carrots. 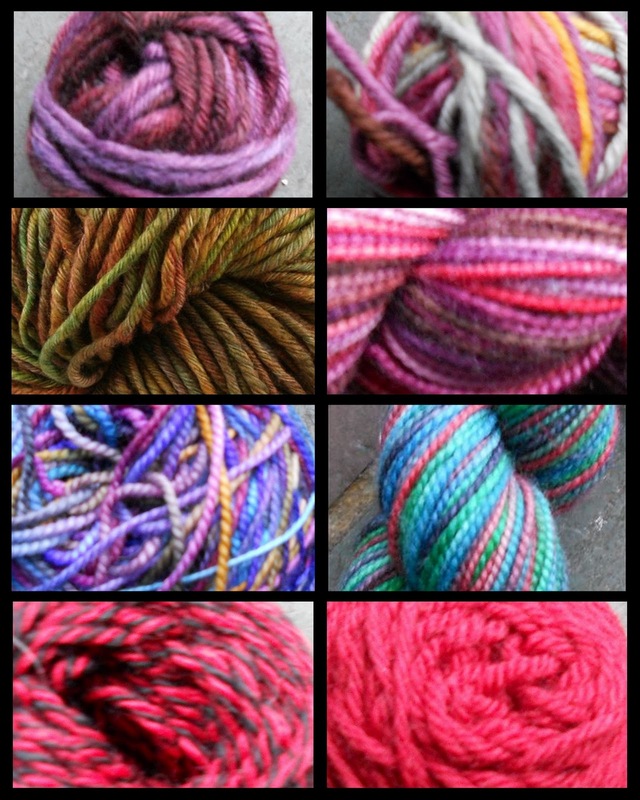 I've run out oaf yarn a coupe of times --at the end of the sunset section and the noctune section. I'm enjoying the knitting, but will be grateful to be finished. 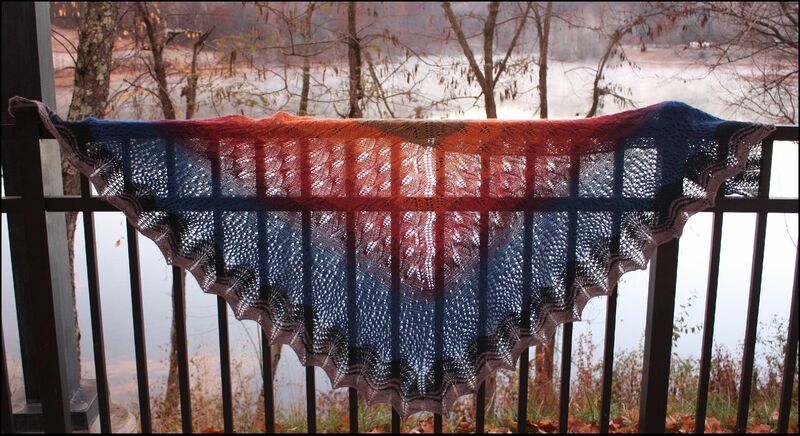 The Seasons Shawl is moving along. I have finished the 7th row of the sunset/vineyard section, and I ran out of sunset. Luckily, I had ordered extra, so I'm still moving along. It looks a little crunched right now, but I imagine after blocking, the leaves will pop right out. 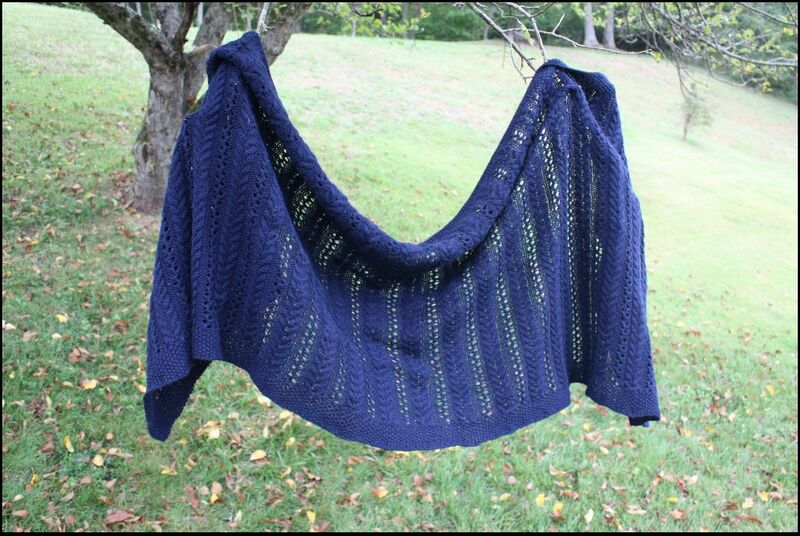 I haven't had a chance to take pictures of the cable shawl, but once it gets cool enough so that I'm not sweating with the wool shawl, I capture its bit and bytes. 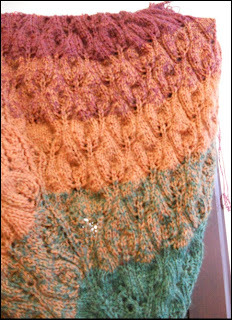 I'm almost done with the movie scarf -- Kavanagh scarf. 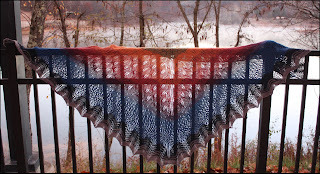 I almost finished the fifth skein, and am contemplating fringe with skein six. It has been great movie knitting because I can do it in the dark. Last Friday, just as the movie started, my knitpicks option needle fell apart, dropping all my stitches. I was able to hold it together for a while and knit, but I finally gave up. After an email to Knitpicks, the needles have been replaced. Great customer service. I normally take pictures for this blog (and my other blog) using my Nikon CoolPix, which I love. When Circuit City was going out of business, Steve bought a Canon Rebel XSi for us. It's a digital SLR camera with two lenses. I've used it some, and love it, too, but feel as if I don't know much about its operation. 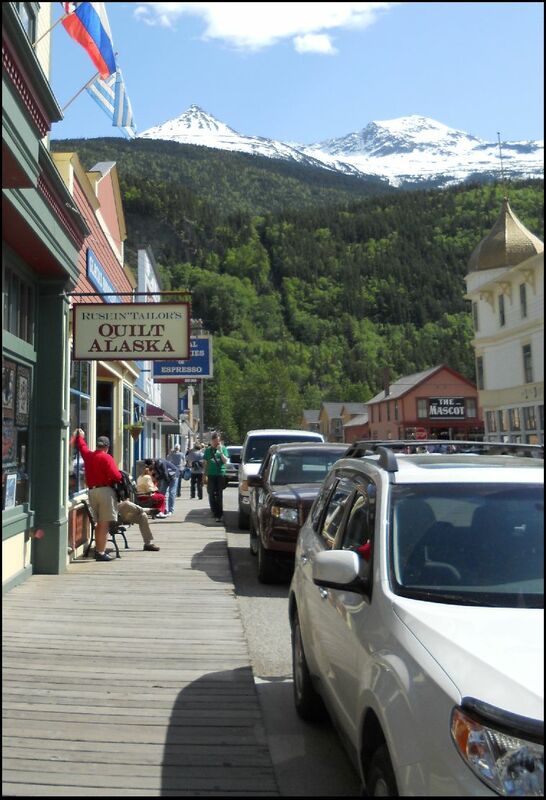 We're planning a trip in May (Alaska! ), so I wanted to take some time to become more familiar with it. I bought a couple of books from Amazon, and am working my way through one of them now (The Canon Digial Rebel XSi Companion). The picture above was snapped as I finished a chapter this evening. 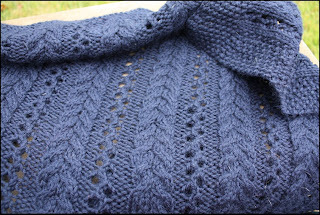 Go take a look at this post on Mason Dixon knitting if you haven't already seen it. Great YouTube video! So, now that I'm moving on, what is on the needles? 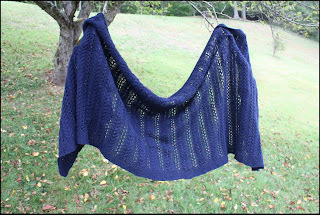 I was planning to do the Kilkenny cable shawl from Cheryl Oberle's Folk Shawls, but I wanted to use Knits Picks Wool of the Andes in Blue Ink. The Blue Ink's delivery date kept moving farther and farther into the future. I had almost given up when it finally became available to order. In the meantime, while I waited, I started a pair of socks with Mountain Colors yarn. I think the needles were too large for the yarn. The sock in progress didn't feel right. My KnitPicks yarn finally arrived, so I sat the socks aside. Between when I stopped knitting them until I moved them out of my knitting bag, three of the needles came out of the stitches. You know I don't like the project when I don't even care about the lose stitches and haven't put them back on the needle yet! 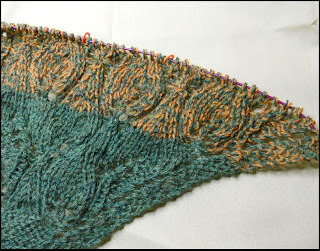 I finally started on the Kilkenny Cable shawl. It's going well. The pattern looks complicated, but it's not. I do it without a chart now -- it was that easy to learn. Long time, no post. I have been knitting, but have also had some periods of not knitting, so progress has been slow. 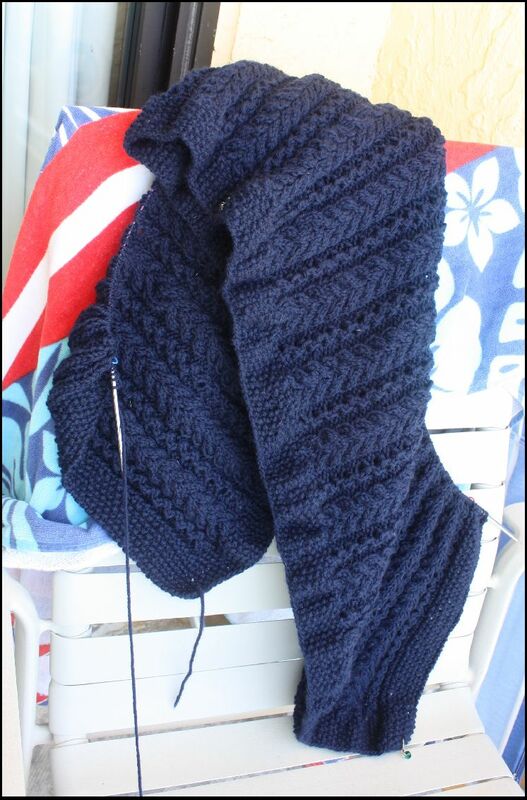 I finished a scarf using yarn (and a free pattern) I bought at the beach last year. The scarf is really too short for my taste, and not really a color I like. I bought the yarn thinking I would use it to make a gift, but then changed my mind. I knit in anyway, but I kind of doubt I'll wear it, and the short length means I probably won't give it away. BUT, it is a finished project. Pattern: The pattern was free from Island Knits when I bought the yarn. I'm not sure I would actually call it a pattern. It's just a simple stitch repeat. Cast a multiple of 4 + 2 (I did 26). On each row, knit 2, knit one through back loop, pearl 1. Repeat to end of row. 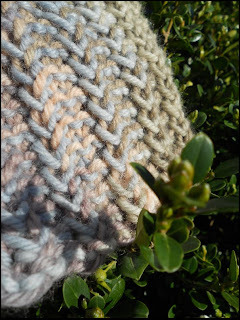 Yarn: Ester Bitran Hand-Dyes Talinay -- it's a beige/pink/blue combination. 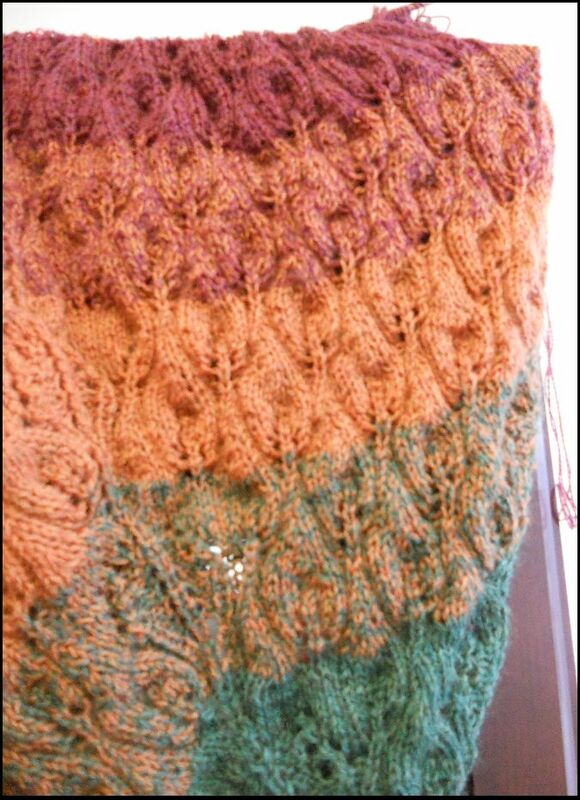 The color of the yarn reminded me of sand and seashells, so on Ravelry I called it my beach scarf.